Was Adam a Wimp…in the Beginning? When did Adam become a wimp-of-a-man like us, blaming his wife for his foolish mistakes? Did God create him to be a milk toast kind of guy…a man who was too cowardly to take responsibility for his disobedience? Not likely. God created Adam in his own image. I picture the newly created Adam as a confident man. It seems to me the moment his lungs were filled with the breath of God, and his eyelids opened, revealing the inexpressible beauty of his surroundings, Adam’s connection with his Creator would have instilled a deep sense of confidence. He had no competition, he had no hero image to live up to, and he had no shoes to fill. It seems that his primary inclination would have been to explore the wonderment of his surroundings—fearlessly. He would have been inclined to walk confidently with God in the stunning beauty of the garden. Even so, Adam disobeyed God. Intentionally. He betrayed the One who breathed life into his body; the One who had instilled within him the almighty Spirit. Adam was not tricked or deceived; his choice was deliberate. We know we are inclined to disobey God, but we attribute our inclination to our “fallen nature.” Adam did not have a fallen nature. His nature—in the beginning—was pure and virtuous. So what could he possibly have been thinking when he took the bite of the forbidden fruit? Something changed in an epic way when Adam took the bite. Perhaps at that very moment Adam became aware of his plight. He realized how ill-equipped he was to take responsibility for his rebellious choice, once he stepped out of the intimate fellowship he had enjoyed with his Creator friend. At that moment, Adam became a wimp like us. Or perhaps it would be more accurate to say we have become wimps like him, since he was the first. What if there was a way to regain the masculine strength Adam had in the beginning? Actually, I believe there is a way to regain the sense of confident manhood we are intended to possess. But it doesn’t happen the way we think it should happen. It is not the result of our effort, or by pretending to be better than we are. It happens when we surrender our weaknesses to God. Men, it is in the admission of our weakness that we connect with God’s strength. God’s gracious strength flows into our lives through the humility of our spirit. While Rose and I watched the crucifixion of Jesus during the final episode of the Bible, I felt ashamed for the times I have not been faithful to God’s call. I regretted the times I avoided the “discomfort” of bearing witness to the work of God in my life. Watching as our Lord was beaten mercilessly—as an innocent man—was almost too much to bear. There were times when I wanted to look away. But I was reminded that since he was willing to be beaten to death as the payment for my sin, how could I look away! How can I ever be a faithful witness to his grace if I cannot even bear to watch as he took my place? After the beating, and the gruesome death, in three days the morning came. And the resurrection! I thought my heart would burst as I shared in the elation of Mary and the others when they discovered that the tomb was empty. All of my shame melted away as I witnessed Jesus’ kindness toward his disciples, even Peter. Their past failures and disbelief no longer mattered. Jesus died to release them, and us, from the penalty of sin. And he died to release us from the guilt and shame of our past foolishness. 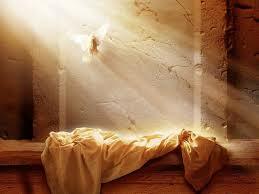 I imagined what it would have been like to have been visited by Jesus after his resurrection from the dead. The look in his eyes supercharged my desire to “risk” being faithful to him, especially when things get a little uncomfortable. One day we will look into his eyes—and he will look into ours—as we give an account of the opportunities, and the gifts, he gave us to serve him. Rose and I looked at each other with a renewed awareness: That’s us! We, and all those who believe because of the witness of the disciples who were there to see with their eyes our risen Lord, are those who have not seen. Nevertheless, he has given us eyes of the heart to believe. Jesus tells us we are blessed for believing. May we each experience a surge of confidence as we go about our day-to-day activities. Our Lord suffered the death that was meant for us, so that we can have everlasting life. How can we do less than bear witness to his amazing grace in our lives!